With the arrival of new iOS 7, Apple additionally included couple of more security ventures for iPhone. What's more, iPad proprietors. Presently when the "Find my iPhone" highlight is turned on, you can not one or the other restore to new and new iOS and nor erase the iCloud account without first handicapping the "Find My iPhone" highlight. Be that as it may, there is another bug in iOS 7 – up to iOS 7.0.4 – which permits any client to not just kill the "Find my iPhone" additionally erase the current iCloud and include any new account. Upgrade: Apple had altered this bug in the late iOS 7.1 update. Be that as it may, there is another bug indeed, even in the most recent discharge which additionally permits the clients to erase iCloud account without knowing the secret word. Read the subtle elements at the base of this post. Nowadays numerous versatile retailers first check whether iCloud is dynamic or not. In the event that there is any account connected with gadget, they inquire the merchant to uproot it first and afterward buy it. On the off chance that you need to offer your iPhone/ iPad yet you have overlooked the password or you don't have a clue about the password, you can uproot iCloud account by utilizing this step below. This step doesn't require any software or exceptional project. You need to perform few steps on your gadget and all is finished. Truth be told it is a bug in the present iOS form. Luckily, this bug has been settled in the up and coming iOS 7.1 variant. Step 1: First of all open settings app and go to iCloud. Step 2: Tap on iCloud account. Step 3: Delete the existing password and enter any password (any random number). Step 4: Tap on Done. Step 5: After verification, iCloud will tell you that either username or password is incorrect. Step 6: Click OK and then Cancel. You will be on iCloud main page again. Step 7: Now again tap on Account and this time remove the description. Tap on Done. Step 8: It will go back on main iCloud page without asking any password this time. Now you’ll see that Find My iPhone feature has been turned off automatically. Step 9: Scroll down and tap on Delete account. from this iPhone. Tap on Delete again. Step 10: This time a new pop-out will show asking you whether you want to keep the data on iPhone or delete it from iPhone. Select one according to you choice. That’s all. 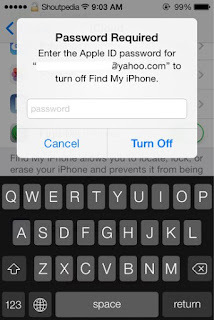 Now you have successfully removed iCloud account on your iPhone / iPad without knowing and entering the password. 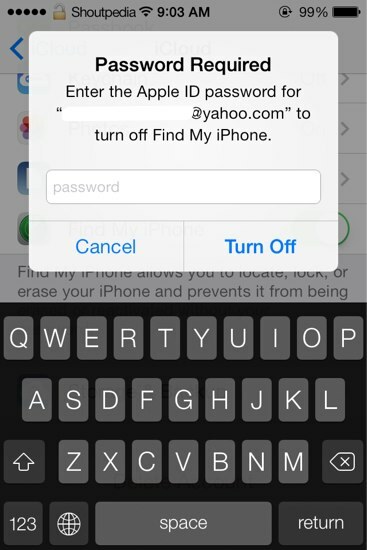 Note: Please use this method to deactivate the account on only your iPhone. This guide is not intended to promote any illegal activity. person to change the Find My iPhone toggle. allows the users to bypass iCloud password request. In this method, you have to toggle the "Find My iPhone" off and tap on "Delete iCloud Account" at the same time. you’ll be promted to enter the iCloud password. Don’t add any password. Instead of that press the Power button and shut down your device. After the device reboots, the iCloud account details are vanished and now you can enter your own details. After that the iPhone won’t be visible on the map. If you want to make your device more secure, make it sure you have set the passcode so that the intruder doesn't have the access to settings app. It is also to be noted that this hack doesn't allows the users to activate iPhone.